Jean Ruggles, of Montauk, and a former first grade teacher at Montauk Public School from 1956 to 1983, celebrated her 90th birthday, on November 11, with a number of events. First, on Nov.10, was a party with about 20 of her women friends at Sammy’s Restaurant, organized by Pat Gilchrest of Montauk. 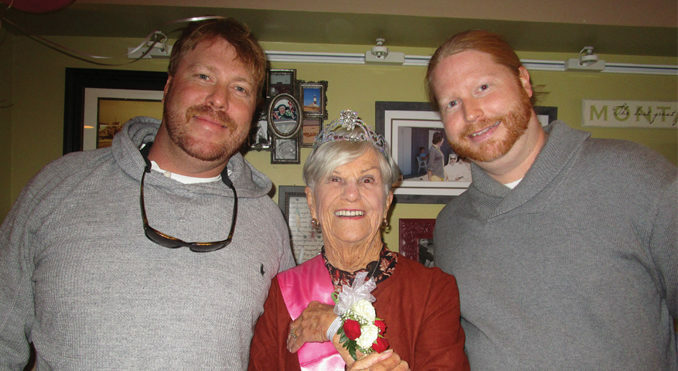 Jean was accompanied by her grandsons, Matthew and Ian Lycke. On Nov 12, Jean was honored at the Montauk Community Church, with a cake at coffee hour. On Nov. 18, she was given a surprise party by her former students, Jim Nicoletti, Robbie Nicoletti, Henry Uihlein, Jay Burke, and Debbie Tuma, at Harvest Restaurant, organized by Jim Nicoletti.